Earlier this year, Emory's Institute for the Liberal Arts (ILA) issued a call for 2015 Interdisciplinary Faculty Fellowships (IFF) — an experimental new program intended to support faculty in pursuing innovative, interdisciplinary research, whether as teams or individuals. Serving in an advisory capacity to Emory College of Arts and Sciences (ECAS) Dean Robin Forman, a committee comprised of ECAS faculty representing the humanities, social and natural sciences helped select three inaugural projects this fall to launch the new fellowship program, which will reopen for applications in November. This is the final installment in a three-part series of Emory Report articles that examines the nascent program and its initial research projects, which began this semester and will be supported for three years. The world of 20th-century Yiddish children's literature is both vast and vastly understudied, according to Miriam Udel, associate professor of Yiddish language, literature and culture for Emory's Department of German Studies and the Tam Institute of Jewish Studies. Although children have long featured prominently in Yiddish literature, Yiddish literature written for and about children didn't really take root as a genre until the early 20th century — a development fueled by Jewish intellectuals seeking to support literacy, new forms of education and ideological ideals. And up until now, much of that literature has remained untranslated — a void that Udel is determined to correct. "Altogether, Yiddish children's literature offers an incredibly rich data field — really, it's the record of the Jewish encounter with modernity," Udel says. "But the people capable of mining it and extracting the treasures to be found within it are fewer and fewer." 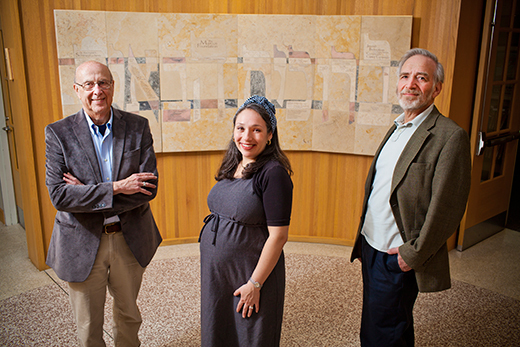 This fall, Udel and a team of Emory colleagues plan to take "the world's first deep dive" into the often overlooked body of 20th-century Yiddish children's literature published between and immediately after World Wars I and II — an immersive interdisciplinary exploration of the Jewish culture of childhood that will examine prose, poetry and drama through multiple lenses of inquiry. Joining Udel in the three-year project will be Marshall Duke, Charles Howard Candler Professor of Psychology, and Melvin Konner, Samuel C. Dobbs Professor of Anthropology — one of three faculty teams selected to receive the 2015 Interdisciplinary Faculty Fellowship through Emory's Institute for the Liberal Arts (ILA). This semester, the literature project launches with a year-long faculty-graduate student symposium exploring translated materials from many angles. A recent class, for instance, was joined by Yiddish-speaking Holocaust survivors who may well have grown up knowing these stories. Next year, the project will expand into a team-taught class for Emory undergraduate students, culminating in an anthology intended to showcase the translated materials, a possible conference and the production of a documentary film. The project, "Children's Literature and the Jewish Culture of Childhood Between the Wars," is rooted in Udel's ongoing commitment to translate early Yiddish children's literature. Many of the stories have never before been translated for modern readers, says Duke. "For me, this project is sort of like being on an archeological dig," he explains. "You know something is down there and we're waiting for her to bring these treasures to the surface." For Duke, a clinical psychologist whose own research frequently focuses on family rituals, the stories offer a rare glimpse into culture and community. "These are essentially stories that are told to children, and most stories have some lesson behind them," he says. "I was interested in them from a developmental point of view, how children are being taught about the world. But I was also interested in the nature of narrative and how, in a formal sense, it is used within a certain cultural group." With a history of interdisciplinary studies through Emory's Center for Myth and Ritual in American Life (MARIAL), Duke found the project an opportunity to engage in what he likes to call "expeditions" — academic forays into disciplines outside your immediate research focus. The early 20th century saw an explosive growth in Yiddish language and literature — a flourishing of the language that has since faded dramatically, Konner says. "There were literally thousands of books, magazines and newspapers published in Yiddish until Hitler murdered a large proportion of the Yiddish-speaking people and drove most of the rest of them out of Europe," he explains. In the 1930s between 11 and 13 million people spoke Yiddish, Udel says. Today, only a few thousand children are being raised as Yiddish speakers every year — mostly children from a group of ultra-Orthodox Jews dedicated to preserving the language, according to Konner. Konner, who is Jewish and has written on the evolution of childhood, notes that the newly-translated literature offers insight into the values of Yiddish-speaking communities during the first half of the 20th century. "And this project is a window into not just one culture, but a group of cultures, with stories written in Yiddish in Poland and Germany and Australia and Buenos Aires, Argentina. One language dispersed all over the world," he adds. Topics range from unusual themes to those common in modern Disney films: parents who die or aren't present; single mothers caring for lots of children; children rising above adversity to become heroic leaders; and even talking animals. Duke recalls one recently translated story from Russia about a young girl who becomes separated from her mother in a train station. Though strangers try to help, the child is distraught, until she sees a familiar face. She runs toward it, and readers discover that it is, in fact, a picture of Joseph Stalin, whom she sees as a reassuring sign of safety. "It's not a story that you would expect to see, Stalin being cast as a friend to children — but it is of its time, in its time," Duke says. "Like things that you find when you are treasure hunting, some of these stories are absolute treasures and others are not. But it's exciting to be able to see something for the first time, to bring fresh eyes to stories about kids and development." The broad aim of the project is to provide an intimate look at social organizations of the day, from families to schools to political parties, Udel explains, adding that there are many directions to take the research. "As it turns out, Yiddish children's literature grows up very much at the same time as the field of child psychology, along with increasingly sophisticated notions of what it means to be a child, what they require," she says. "It's also a good place to enter into Theory of Mind questions — how we imagine the minds of another and how adult authors imagine the mind of a child. What do you spell out, what do readers assume, what is implicit?" Beyond such insights, the project is also doing something more: Unfettering voices that have long been locked away from a broader audience. "My heart goes out to all the people of the world who've written in languages that very few people speak, and possibly may not survive much longer," Konner says. "Their voices are being lost. Yiddish is not the worst-case scenario, but it is one of the cases. Miriam is doing something very important in keeping those voices alive." Extra: Read Miriam Udel's translation of the Yiddish children's story, "A Sabbath in the Forest."